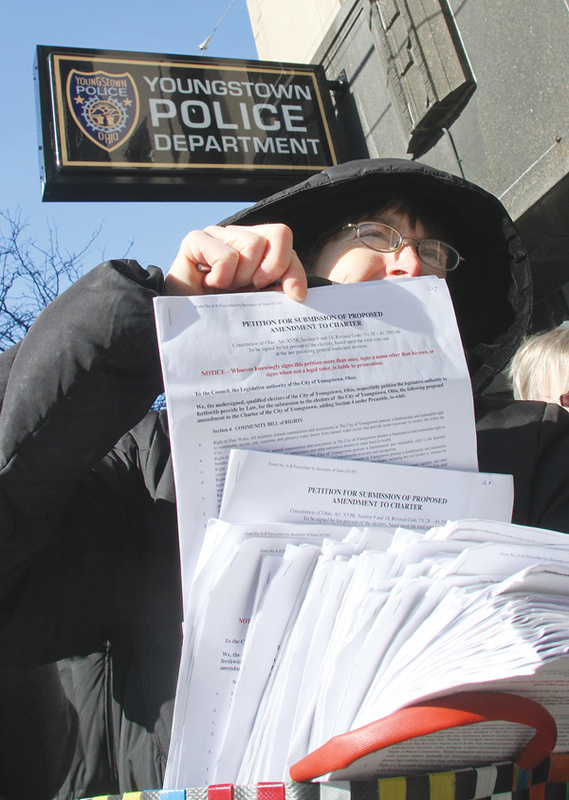 Published: Thu, February 7, 2013 @ 12:10 a.m.
Anti-fracking activist Lynn Anderson holds a stack of petitions that she and others delivered to Youngstown City Hall on Wednesday. Backlash over Hard Rock Excavating’s decision to dump thousands of gallons of fracking waste into a storm drain continued Wednesday with sharp criticism of both state law and the oil and gas industry. Environmental groups, elected officials, the public and even the industry itself decried last Thursday’s incident when inspectors with the Ohio Department of Natural Resources were dispatched to Hard Rock’s headquarters at 2761 Salt Springs Road only to witness an employee cleaning out what is now described as a tanker truck filled with brine and oil. Stoking the outrage were documents released late Tuesday by the Ohio Environmental Protection Agency that show Ben W. Lupo, a partner in several companies headquartered at the site, and owner of both D&L Energy and Hard Rock, instructed an employee to dump the wastewater down the drain, which eventually emptied into the Mahoning River. Youngstown Fire Chief John J. O’Neill Jr. said he spoke Wednesday with Kurt Kollar, the on-scene coordinator for OEPA’s Division of Emergency and Remedial Response, who told him 40,000 to 50,000 gallons were dumped into a storm sewer that empties into the Mahoning River. “They plan on filing state and federal charges against the appropriate parties,” O’Neill said Kollar told him. “That’s why they’re being sketchy” with details. About 90 percent of the cleanup was done by Wednesday, O’Neill said. Initial reports estimated the amount of fracking waste to be about 20,000 gallons. But O’Neill said Kollar told him it was 40,000 to 50,000. Chris Abbruzzese, deputy director for communications at the OEPA, said his organization is awaiting the test results from samples taken at the spill site over the weekend. Once regulators confirm what was leaked into the ground and the river, he said a decision would be made to retain the evidence for its criminal investigation, inform public officials or both. He said periodic updates would be made available to the public as the investigation continues. State Rep. Bob Hagan of Youngstown, D-58th, announced Wednesday that he’s calling for a special prosecutor to investigate the incident independently of the criminal investigation being undertaken by the ODNR and OEPA. “I want a prosecutor that’s going to get results,” Hagan said. Hagan added that he has talked with Mahoning County Prosecutor Paul Gains to gauge his interest in pursuing a case against the suspect parties, which legislative aides told him was possible. He also will introduce legislation early next week that requires regulators and emergency responders to notify elected officials of spills immediately. City council members expressed outrage and anger toward Lupo and his companies over the intentional dumping of fracking waste. Ray said he saw cleanup crews on the Salt Springs Road location Saturday, but thought it was construction activity related to V&M Star’s expansion project. 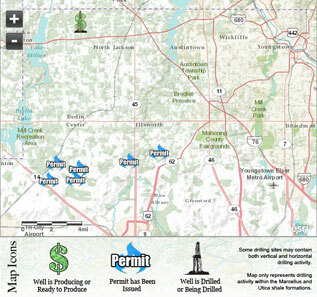 Environment Ohio, a statewide citizen’s advocacy group, chastised the dumping and called state laws that allow oil and gas companies to withhold what chemicals are used in the process both inadequate and favorable to the industry rather than public well-being. Thomas Stewart, executive vice president of the Ohio Oil and Gas Association, disagreed with Boggs, noting that Ohio’s laws regulating the industry are among some of the strongest in the nation. He expressed dismay at Hard Rock’s decision to dump the wastewater down a storm drain. Hagan also said state Rep. Mike Foley of Cleveland, D-14th, who sits on the state finance committee, plans to include an amendment in the governor’s budget proposal calling for a severance tax to help pay for additional oil and gas inspectors. U.S. Rep. Tim Ryan of Niles, D-13th, said he was pleased by the response of state regulators.